The I.O.O.F. and the Knights of Pythias Building on the corner of Main Street and 1st Avenue South was built in 1914 by Piper Construction Co. It was designed by Wasmansdorff and Eastman. 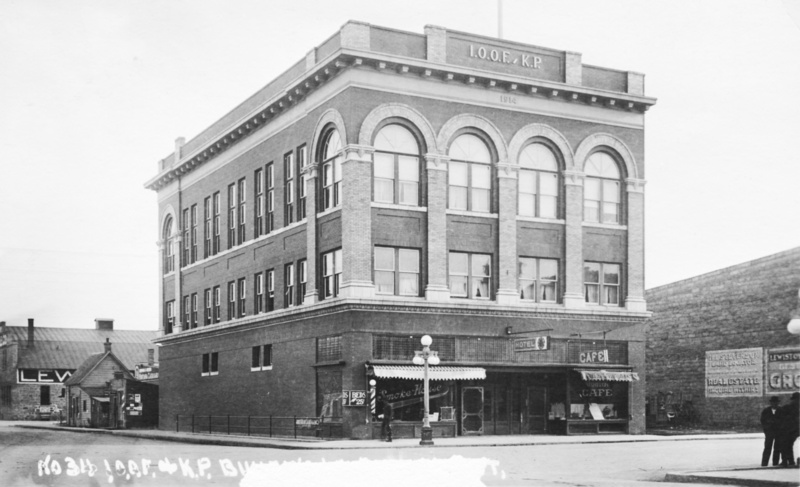 Two fraternal organizations, the Odd Fellows and the Knights of Pythias joined together to erect this building. “The two orders will, it is expected, have a combined membership of not less than 300 by the time the building would be under way and both are growing rapidly. The Odd Fellows a few years ago secured a fine site for their proposed building at the corner of Main and Daws Streets, while the Knights of Pythias more recently acquired the site at the corner of 5th Avenue and Washington Street, opposite the Reynolds residence. The order may sell off these sites and acquire a new one or may sell one and use the one considered best suited to such a purpose”. (3-11-1913 Fergus County Democrat). “The plans were decided upon after an open competition and call for a very handsome structure, three stories and full basement to be built of Lewistown Pressed brick [from the Lewistown Brick and Tile Co. which was located ½ mile out of Lewistown at the end of 1st Avenue South] and terra cotta. The building will cost about $50,000 and the two orders paid $14,000 for the site. The excavating will begin in a few days”. (Oct 4, 1913). On March 10, 1914 the contracts were awarded to Piper Construction Co., Bisbee and Kane were awarded the contract for the plumbing and heating and Neudigate and Son for the cement work. It was finished in 1914.